The Animal Welfare League Queensland (AWLQ) has come forward to express disappointment over the number of new apartments being developed across Brisbane city which do not welcome pets. "The concern is that many people are choosing to move from a home to an apartment - especially as they age - and they are finding it difficult to take their pet with them," AWLQ Strategic Director Joy Verrinder said. "It's sad because most pet owners treat their pets as family and really don't want to leave them, and the animals also feel the loss. "AWLQ said their research revealed that four-legged pets are accepted in as little as three per cent of new apartments on the market in inner Brisbane, and the lack of pet friendly residences are responsible for hundreds of surrenders each year. The league's search for new apartments within five kilometres of the Brisbane CBD on realestate.com.au found 7 of 270 were tagged as pet friendly, while the same search on domain.com.au found only 113 of approximately 1,000 apartments would accept animals. Statistics from AWLQ show that of the more than 2,500 animals surrendered to the charity across South East Queensland in the 2015/2016 financial year, almost a quarter were surrendered due to moving house or an inability to find appropriate accommodation. Inability to find pet friendly accommodation was the most frequent reason given for surrendering an adult dog and the second most frequent reason for adult cats. Ms Verrinder said that the laws need to change to avoid an influx of surrendered animals over the coming years. "Developers need to play their part by re-thinking their stance on pets, and ideally the laws should be reformed to make it illegal for any body corporate or landlord to refuse a resident with a pet - as long as they can demonstrate they are a responsible owner. "“Many places will only allow small dogs as well, which is disappointing. The decision should be based on the individual animal as their suitability will depend on many factors such as activity level of the animal and their owner, personality and training," she said. 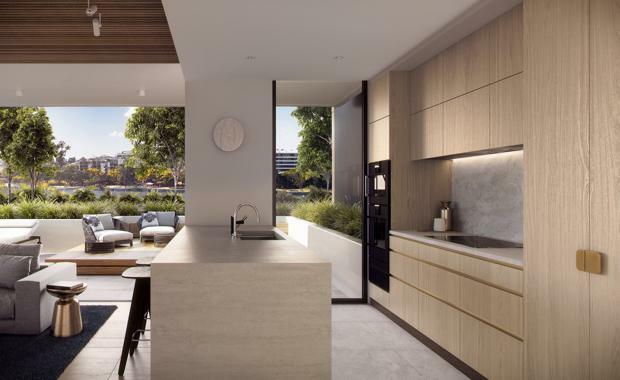 Developer John Li of Ideal Property said that 'Banc', which is a residential project in Toowong expected to begin construction in early 2017, will be pet friendly and this fact has helped to seal the deal for a number of purchasers. Banc interior"Some are concerned that living in an apartment means their pet won't have the same quality of life as they did when they had a backyard - but Banc has access to the riverfront with kilometres of pathways for people to exercise their pets," he said. More than a third of Bancs' 33 apartments have already sold off-the- plan - predominantly to downsizers who are looking to bring their furry family with them to their new home. "Many of our recent buyers have been mature professionals whose children have left home, so their pets are an important part of the family unit," Mr Li said.